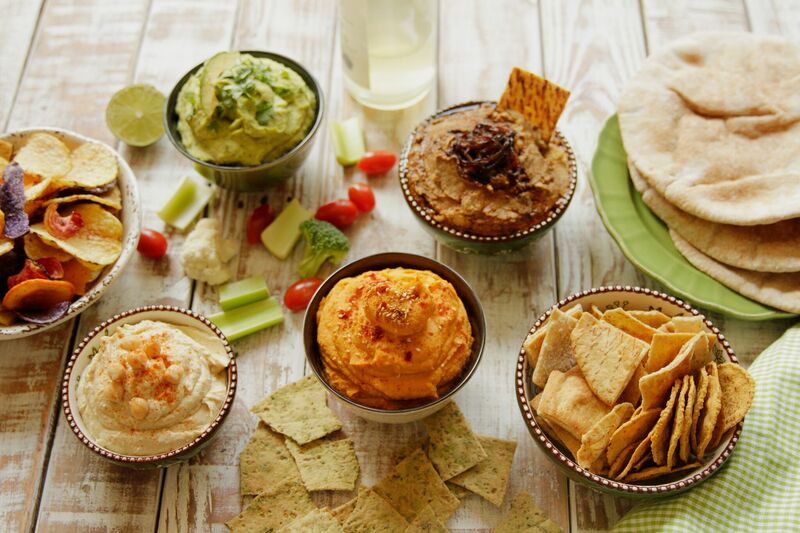 Hummus is hands down the perfect dish to enjoy during the heat of the summer — when you’re craving something cool, creamy and delicious. It’s also incredibly versatile. Sure, you can serve it as a dip with pita, crackers and fresh veggies, but it’s also wonderful in a wrap or on a sandwich, dolloped on a salad, spread on a flatbread pizza, or tossed with hot pasta. And homemade hummus tastes so much better than store-bought. 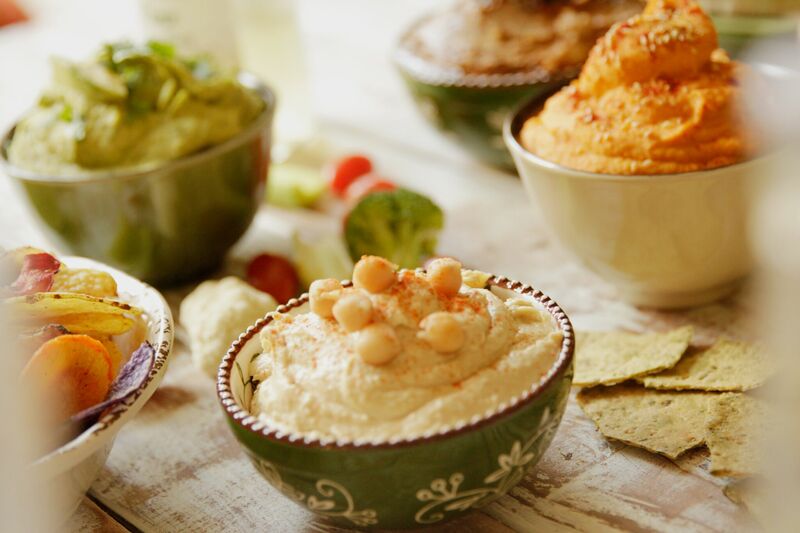 Once you realize how easy it is to whip up hummus from scratch, you’ll never go back. Read on for winning tips on how to make it great. 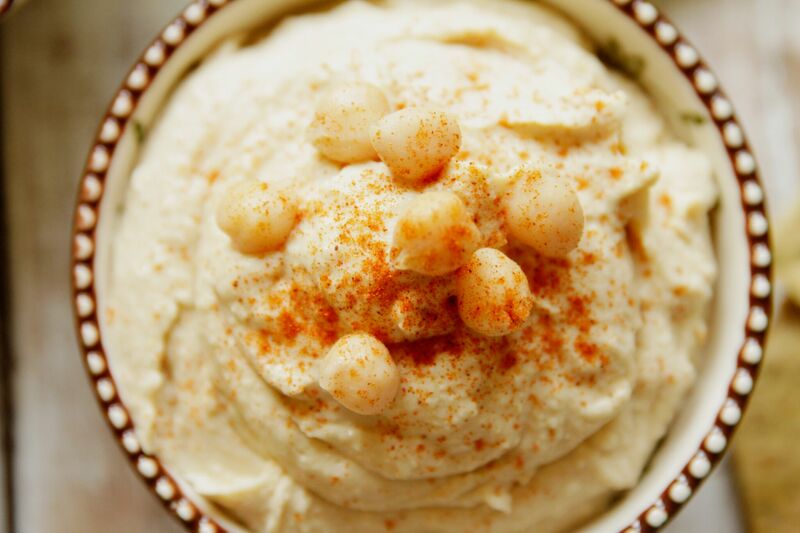 Using dried garbanzo beans (also called chickpeas) to make hummus is key. (The canned variety just won’t give you the same great flavor.) But be sure to soak your dried garbanzos overnight first. They’re tougher than other beans and take longer to soften; soaking will give you a head start and shorten cooking time. Once you’ve got your soaked garbanzo beans covered with fresh water and simmering in a pot on the stove, add in a bit of baking soda. 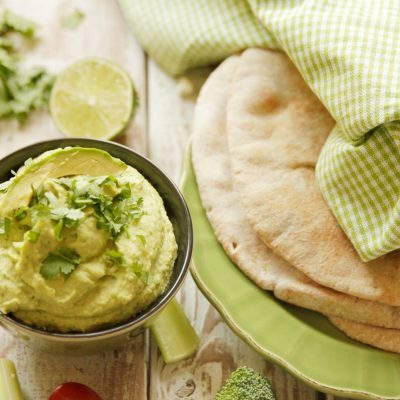 Baking soda works to tenderize both the skin and the bean, helping you achieve a silkier hummus texture. Chefs who know their hummus swear by cooking the garbanzos until they’re practically falling apart. So, don’t cut your cooking time short. If you’ve soaked them first, simmering till very soft should take about 1-1.5 hours. The best time to make your hummus is when the garbanzos have just finished cooking and are still hot. This helps with extra creaminess, as well. 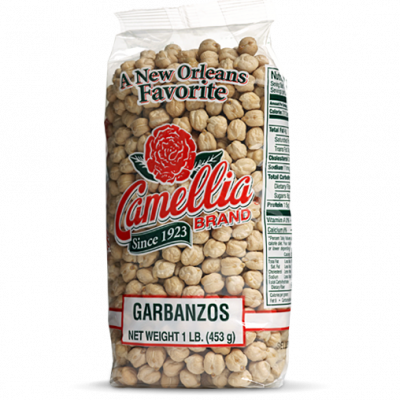 Before draining, reserve the garbanzo bean cooking liquid (also called aquafaba). You’ll want to use it when blending the hummus (more flavorful than adding water). And it makes as an amazingly healthy vegan alternative to dairy and eggs. Now that you’re ready to get cookin’, it’s time to consider all the flavor possibilities. 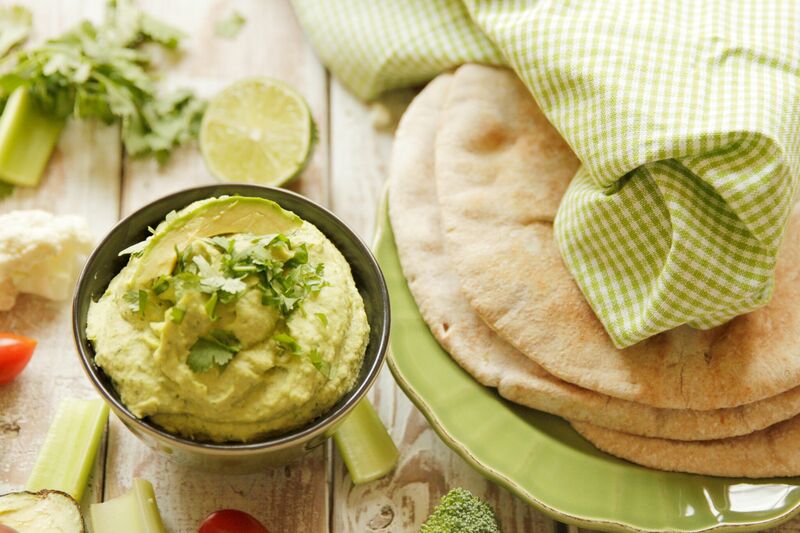 Purists might want to stick with our traditional Hummus recipe. But if you’re willing to experiment, we’ve come up with amazing twists on our classic recipe that add color, flavor, health benefits, and fun – all with just a few additional ingredients. Whether you’re making hummus for the 1st time or the 50th, this foolproof recipe will become a hands-down favorite. With just the right proportions of olive oil, lemon juice, tahini, and garlic, the texture is right on (if you follow the tips above), and the flavor is fresh and deliciously balanced. And because the recipe calls for a pound of garbanzo beans, it yields about 6 cups of hummus. Which means there’s plenty to use in the recipe variations spelled out below, or simply plenty to snack on all week long. 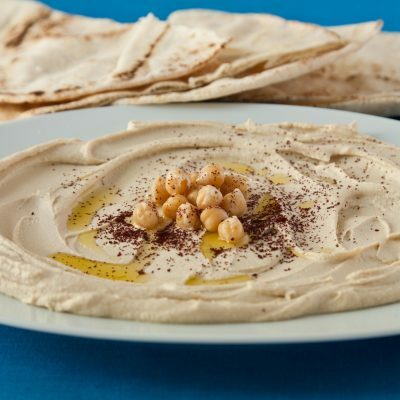 Note: the recipe doesn’t call for refrigerating the hummus before serving, but a lot of folks like it served cool vs. warm. Your call. 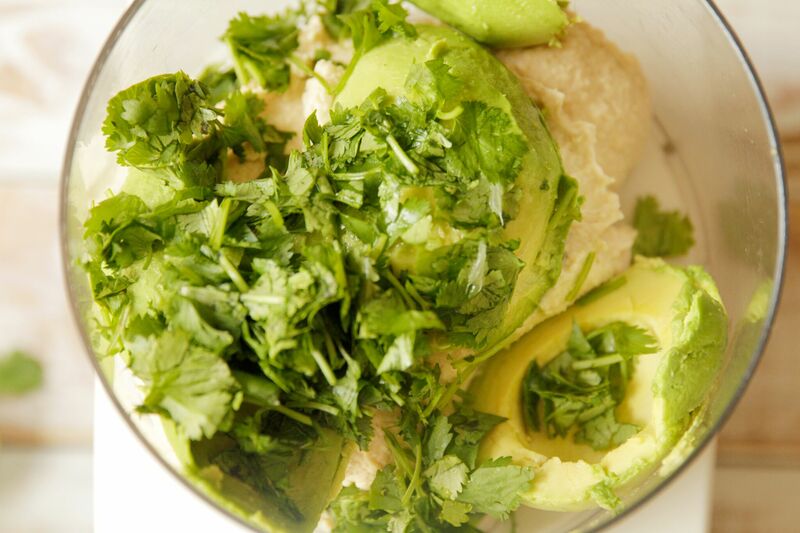 For a gorgeous green tint, even more fresh flavor, and additional heart-healthy fat, fiber, and potassium, try adding 1 ripe avocado, 1/3 cup fresh cilantro, and 1/2 lime, juiced to 2 cups prepared hummus. Whip it up in a food processor, and voilá — you’ve got a yummy new take on a classic. For a fast snack or lunch, warm a whole wheat tortilla, spread with Avocado Cilantro Hummus, top with fresh baby spinach and shredded carrots, roll up, and enjoy. 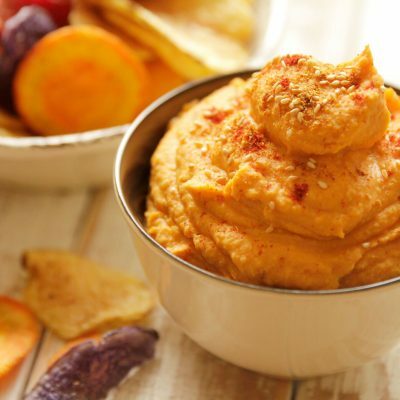 This beautifully-tinted orange version comes together with 2 small, baked sweet potatoes, 1/2 teaspoon smoked paprika, 1/4 teaspoon of cayenne pepper, and a few shakes of Tabasco brand Chipotle Pepper Sauce (or chipotle powder). Add all to 2 cups prepared hummus and whir till blended. 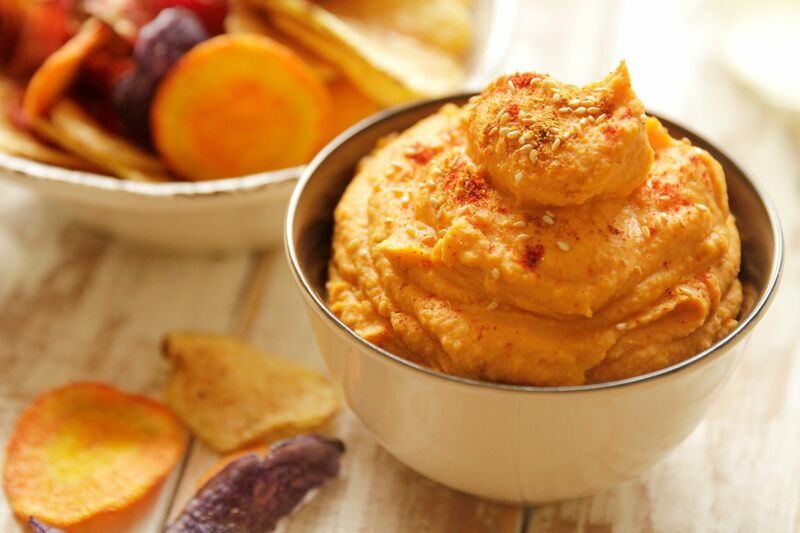 Adjust seasonings to your taste, and try spreading Spicy Sweet Potato Hummus on a turkey sandwich or scooping it up with tortilla chips. 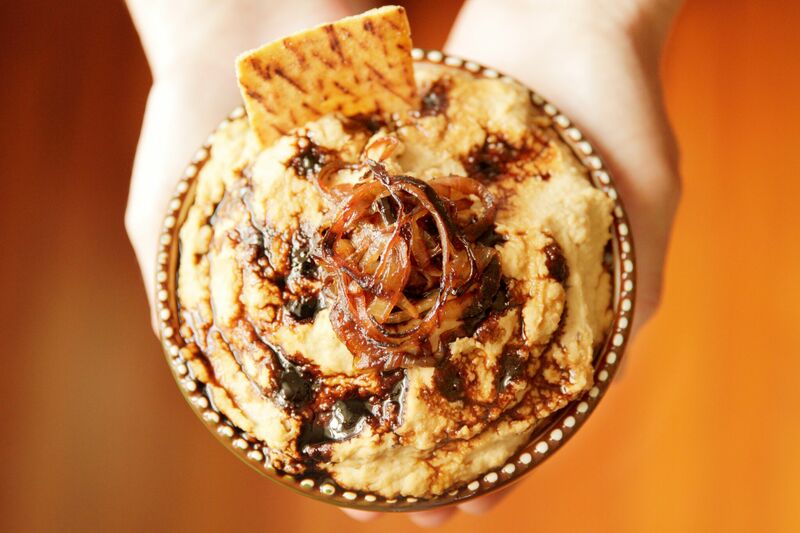 While Balsamic Caramelized Onion Hummus is slightly more involved, the result is totally worth it. Thinly sliced onions are slowly cooked down in olive oil, along with 1 teaspoon brown sugar and 1 tablespoon balsamic vinegar, until caramelized. Then a balsamic reduction is made by simmering 1/4 cup balsamic vinegar until it’s thick and syrupy. The caramelized onions are blended in a food processor, along with 1/2 teaspoon brown sugar and 2 cups prepared hummus. 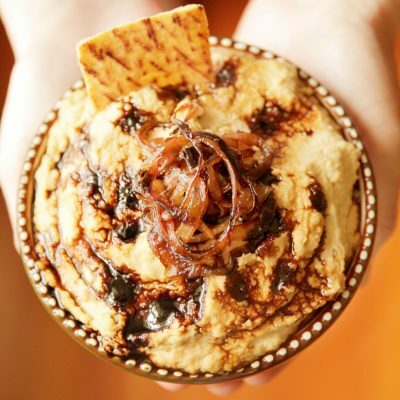 For a beautiful presentation and amazing flavor, serve Balsamic Caramelized Onion Hummus topped with extra caramelized onions and a drizzle of balsamic reduction — surrounded by fancy crackers and crudités. A fabulous way to entertain friends and family!